« Trading Has Just Become More Exciting! Anyone who’s been watching the Xfactor as well other similar talent shows knows that these people aren’t mostly the real deal. I’ve come to realise that almost all of them are in some way professionally trained which makes the whole your-average-person-turns-superstar angle look very shady. Even though these kind of shows are massively fixed and fabricated to a great extent, in my opinion, I still watch some of it like funny auditions for instance. The latest series of “Britain’s Got Talent” has been airing for several weeks now. 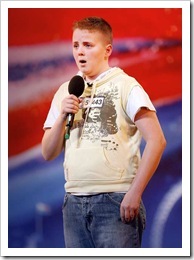 They are still on the auditions and one 13-year old school boy could very well win this show. Andrew Johnston went on stage and told everyone that he was being bullied at school and lived in a sort of council ghetto. Yet another sob story. But what’s this? Just a few days after the nation has taken this plucky council estate boy to their hearts, I am standing at Andrew’s front door in Carlisle wondering if I have the wrong address. Frankly, this estate is less sink and more, well, scented bath. To be honest, I’d quibble with the “estate” tag at all. In London, this sort of arrangement of neat, modern, red-bricked semis, all shaped into attractive culs-de-sac, would be called a “development” – and a perfectly desirable one at that. There are neatly kept lawns and hanging baskets. Is that a BMW in that driveway? It is! And there’s a Merc. Andrew was unequivocal. When asked what his dream was on Britain’s Got Talent, he talked of wanting to take his mother away from all this, and giving them both a better life. How puzzling. When I am ushered into the family living room, Andrew’s mother, Morag Brannock, admits, a little apologetically, that the pudding may have been a little over-egged, in terms of the woefulness of this estate. No hoodies, used condoms or graffiti in sight then and the bullying, his mother added, seemed to be a thing of the past. But the truth does very rarely make headlines, let alone, millions of pounds. This entry was posted on Saturday, April 19th, 2008 at 10:14 pm	and is filed under Entertainment. You can follow any responses to this entry through the RSS 2.0 feed. You can skip to the end and leave a response. Pinging is currently not allowed.